At the risk of being in the hot seat as readers try to discover errors in this blog, it is important to remind job seekers, particularly recent graduates, that writing proficiency is ‘top of the list’ for most recruiters. Well, that’s good, you say because I am writing all the time. Yes, written communication has increased with technology, but ICYMI, the ability to write Twitterese, texts, and Facebook posts, IMHO, is not likely to impress hiring managers looking for more technical business writing – LOL! Poor writing skills can keep you from getting hired or promoted, and it can even get you fired. Time to take a reality check on what employers are looking for and how your skills stack up! In the 2016 Workforce-Skills Preparedness Report by PayScale, “44 percent of managers feel writing proficiency is the hard skill most lacking among recent college graduates…” 56% felt that recent graduates did not pay attention to detail, a facet of editing. These results, however, did not match up with how college graduates assessed their writing. 87% surveyed felt that their skills prepared them for the job, of which 50% of managers disagreed. Clearly, a perceptual gap exists. To compound the lack of competent writers is the impact of the high cost of training once hired. A study from CollegeBoard, a panel established by the National Commission on Writing, estimated that private sector businesses could be spending as much as $3.1 billion on remedial training or $950 per employee. When companies are spending these amounts on basic skills training, generous salary increases are less likely. As a potential new hire, what can you do to help close this gap? First, know that many companies now assess writing skills before hiring because proficiency is often perceptually linked to other personal characteristics. One respondent to the CollegeBoard Business Roundtable noted: “My view is that good writing is a sign of good thinking. Writing that is persuasive, logical, and orderly is impressive. Writing that’s not careful can be a signal of unclear thinking.” Before you interview, think about brushing up on your writing skills, and be prepared if you are asked for a writing sample. A hiring manager’s dream candidate must go beyond elementary writing skills. She or he should be able to write and edit error-free presentations and business documents such as e-mails, letters, memos, proposals, marketing plans, white papers, or website content. These will be detailed, well-organized, technically correct, and highly professional in appearance and tone. Many students come out of liberal arts colleges with writing styles that managers cannot use: essay style, academic, and lacking in technical language or tone. If you do not have exposure to preparing business documentation, consider taking a business writing course at your local community college. Though all industries require written communication, some have more stringent needs than others. For example, if you are applying for a job in public relations or marketing, errors can be costly. In 2006, Alitalia Airlines mistakenly priced business-class at $39 instead of $3,900, costing the company about $7.2 million. Poor word choice can also twist meaning. One television credit identified its male guest as a “scuba diva.” If you struggle, have others who write well edit and offer feedback. A poorly written job application or resume is a sure sign that you are unlikely to be hired, since gatekeepers are trained to screen out those with writing deficiencies. Triple check all documents related to your job applications. We often hear people claim that they have “no talent for writing,” or “I’ve never been able to write well.” However, the good news is that writing is not an innate ability. With some persistence, it can be learned or re-learned. William Zinsser, who wrote the classic book, On Writing Well, said, “Writing is hard work. A clear sentence is no accident…If you find that writing is hard, it’s because it is hard.” Take the time to learn and practice your writing. A good first step is to read. The more you read, the better you will write. 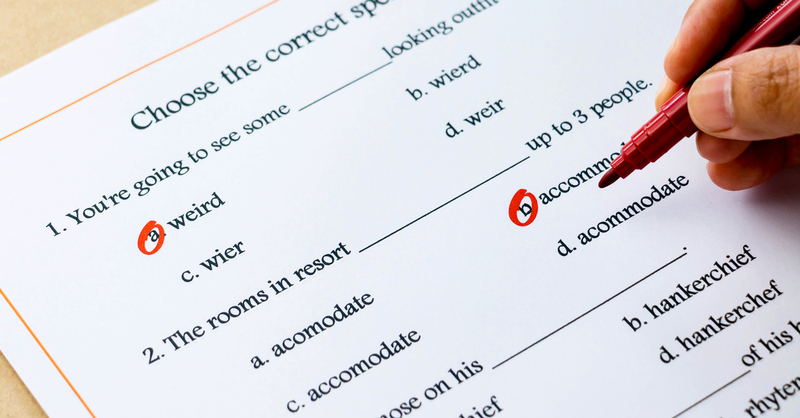 Avoid embarrassment by reading your writing and correcting mistakes. For English language learners, do not let poor writing skills hold you back. Get some help preparing personal marketing documents and error-checking your online job applications. Once in the door, show the interviewer evidence that you are working on improving your writing skills. Most companies understand how complex the English language is and are willing to help. Just be sure you are taking steps to consistently build your communication skills. Finally, the written word is empowering. The practice of writing helps us to analyze, think critically and logically, and be mindful of details. Proficiency will give you a competitive edge, expand your opportunities, and most importantly, help you to communicate compelling ideas. Take the time to improve your writing.